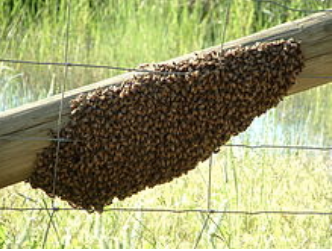 How do you remove a swarm of bees? Removing a swarm of bees is much easier than removing a full hive because there is no wax foundation and generally they are not found inside a wall, attic, or space that is inaccessible without removing or cutting into it. We use a state of the art bee vacuum that allows us to then safely remove them, relocate them to our family bee apiary, and give them a home with food and allow them to build and grow. We warranty each hive removal for one year against another swarm moving into that same area. If at anytime you notice bees again, give us a call and we’ll come out for FREE! › So Cal Restaurants shut down due to Cockroach/Rodent infestations. › Rats force Dunkin Donuts to shut down!!! › It's almost that time of year! 8 tips to keep spiders out! › I've got BEES, What can you do for me? › Do you know the signs of Rats in your home or facility?